It's another busy weekend at the box office as four films again try out the marketplace, with one again potentially challenging for some end of year awards. Bonus point: it won't be swamped by a nearly 20-year-old cartoon. 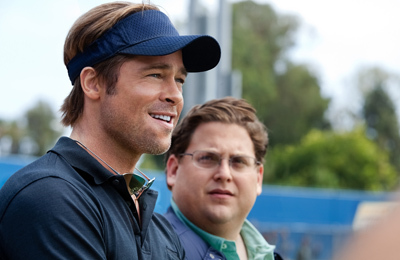 Leading the way this weekend is Moneyball, the adaptation of Michael Lewis' book about the 2002 Oakland A's and their GM Billy Beane, who found a way to compete with the Yankees and Red Sox of the baseball world on less than half the budget – doing so by valuing players differently than other teams had throughout the history of baseball. Whatever you think about sabermetrics (or if, say, you've ever heard of the term), the story is a remarkable one that changed the face of baseball (there's a reason, for instance, that we actually pay attention to OPS as a stat). For a long time, the subject seemed unadaptable – who's going to watch a film about taking advantage of economic efficiencies? The project fell into Brad Pitt's lap, who began what seemed like a quixotic attempt to bring it to the screen over years and years, with Aaron Sorkin and Steve Zaillian both taking a crack at the screenplay. They seem to have turned the story of doing more with less into something resembling a conventional sports story mixed with a scrappy iconoclast film – sort of the love child of The Blind Side and The Social Network. Also starring a pre-slim down Jonah Hill (we get at least one more movie with him like that), Philip Seymour Hoffman, Robin Wright and Chris Pratt, Moneyball has a decent supporting cast, but the true draw here is Pitt, who's given free rein to be his charming and enigmatic-best. In the past six or seven years, that's meant some very good things for his films, setting aside the films like The Tree of Life or The Assassination of Jesse James, which never tried for wide release. And while it's true that he's had some action and animated films in there to boost his average, it's hard to find a box office stinker among his recent films. The best candidate, using only the films that tried, is Burn After Reading, which still opened to $19 million. Even though baseball films (particularly ones that are quite literally inside baseball) aren't always guaranteed box office smashes, the strong reviews should lift this above Pitt's floor, to around a $23 million opening weekend. The primary action fix for the weekend (we'll get to the reason for that qualification later) is Killer Elite, the seemingly annual Jason Statham fall action film. In one small and one huge way, that's underselling the cast, since it includes Clive Owen's ridiculous moustache and one Robert DeNiro. Statham stars as a member of a special ops squad pulled back into action when his mentor (DeNiro) is kidnapped and held for reasons I'm sure make perfect sense to the plot. It's getting somewhat difficult to tell Statham's films apart, but he actually remains a pretty consistent draw on his own – throw him in an action film, showcase some stunts, and you're going to get between $9 and 12 million opening weekend. We've got that, and this is getting a proper release (even with the baffling use of Scorpions for trailer music). So then, we're left to ask if Owen and DeNiro really add anything to the film's potential box office. Probably not, since there's a big overlap between Statham's audience and those who'd see Owen in an action film (which, if you look at Shoot 'Em Up, isn't many). DeNiro, meanwhile, has spent the last several years destroying his legacy of quality with films like the Fockers movies and dreck like Righteous Kill. These additions bring in pretty close to nil, and we're still sitting at around $11 million for its debut. Just how many 14-year-old girls with too much money are out there, anyway? More than anything else, that's the question that Abduction would appear to pose, with Taylor Lautner getting his first leading role – in an action film no less. Lautner stars as a teen who stumbles on the fact that he'd been kidnapped years ago, and that's he's also a genetically engineered superspy or some such mumbo jumbo. Then he goes around kicking people in the face. The premise probably takes the best advantage of Lautner's particularly … limited set of acting skills, but I don't know if that's saying a whole lot. Amazingly, that might be the least objectionable part of the film, as (Academy-award nominated! Oh how so long ago) John Singleton's direction and first time feature writer Shawn Christensen's script also taking significant hits from the critics. Okay, so maybe anything putting the least-talented of the Twilight kids front and center wouldn't have gotten a fair shake from critics, but the universality of the response to it leads me to believe they're dead on. Well, that and the hilariously wooden line readings in the trailer. Even Paul Walker winces at those. Amazingly, Lautner's stunt work has gotten him some positive attention from heavyweights in the industry, and has Sylvester Stallone eager to work with him. Damning with faint praise, sure, but that's something. The only real examples of post-Twilight returns for its stars come from Robert Pattinson's films, Remember Me and Water For Elephants, neither of which makes for a good comparison. Still, those two prove that there are people willing to see these actors in non-Twilight films for some reason. While action films get a higher floor than most other films, the ridiculousness of Abduction looks to keep it to around $7 million this weekend.